Platform Size 8" x 6.5"
Scale Size 8" x 8.52" x 0.5"
Aquatronic FeatureLots of kitchen scales only let ya weigh dry ingredients, but not this one. The Taylor 3879 digital food scale can measure both wet and dry ingredients...It's the ultimate recipe scale! 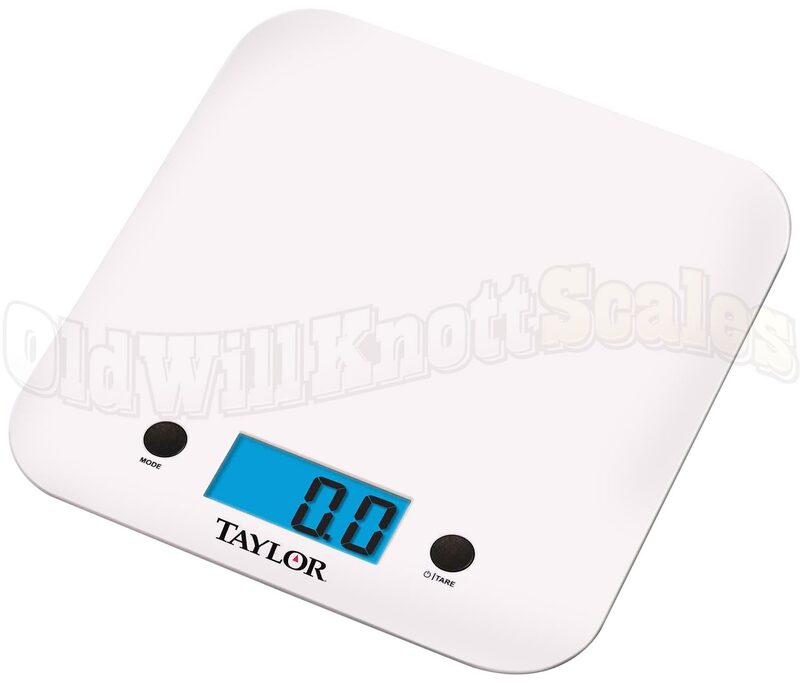 Perfect For Recipes!If you're having a tough time getting consistent recipes, you should try weighing out each ingredient with this Taylor kitchen scale. When ya weigh what you're putting into your mixes, you have a better chance of your recipes coming out the same each time. And the best part is...no more measuring cups! Just weigh your ingredient, set the scale back to zero, and weigh the next! This sleek kitchen scale can handle up to eleven pounds of ingredients. 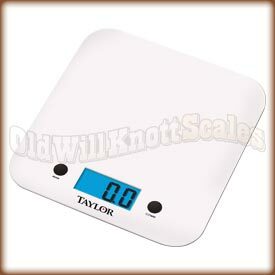 Tare FeatureThe tare button on the front of the 3879 kitchen scale can be pressed to "zero out" the weight on the scale. You can then add more weight, and the display will only show the weight of the items you're adding. This sure is useful when ya want to use a plate or bowl to weigh your food. Energy Saving Auto-OffIf ya have ever had the batteries in something run out because you forgot to turn it off, you'll realize what a blessing this feature is. The Taylor 3879 will automatically turn off after about three minutes of inactivity, saving battery power and money. It Remembers The Last Unit Ya UsedIf your application needs weights in the same unit of measurement, (like ounces for instance), it can be a real pain if your scale always turns on ready to weigh in grams. It's a good thing the 3879 turns on displaying the unit of measurement you were using when ya turned it off. 1 YEAR MANUFACTURER'S WARRANTY!Taylor provides a one year warranty on this kitchens scale, so if ya have a problem with your scale, just contact the Taylor warranty center. The scale seems quite accurate and it's large area on top allows me to see the reading with fairly large containers on it. Extremely thin (how does it work?) so i can store it between my cookbooks on the counter. Immediately replace the batteries. Scales do not work well with dying batteries and the batteries that came with it died in weeks. Luckily they are very common and cheap (i buy in packs of four).